Intellectual property laws protect ideas—this encompasses patents, copyrights, and trademarks, among other types of profitable ideas. This is a fast-growing area of law as technology continues to advance, and it is also statistically the most lucrative—the median pay is nearly $139,000, while people on the high end make $250,000 or more per year. Do you like the idea of working in the business of changing laws for the betterment of an entire state or country? Maybe a career in politics is for you. While a law degree isn't a necessary requirement to get into politics, it has widely been seen as the most common route in recent years. Members of Congress bring home $174,000 per year, and some higher positions within Congress (like Majority Party Leader or Speaker of the House) bring in $194,000 each year. Trial lawyers are the ones you see on television and on the silver screen—they stand in courtrooms and argue cases before judges and juries. There are fewer trial lawyers than there are law graduates who want to do this job, so competition is often fierce. There is a decent payout for those who succeed, though—the median pay for a trial lawyer is $120,000 per year, which some making upwards of $215,000. Chief Legal Officers lead the legal departments of large corporations, and they are handsomely rewarded for doing so. The median pay for a CLO is $183,000, with some making as much as $285,000 per year. Getting a CLO position takes time and hard work, though—there are very few of these positions available across the country, and many require at least a decade of experience. Tax attorneys work with both individuals and businesses to solve tax issues, help with estate planning, or suing the IRS. They are often essential consultants when starting a business of when contracts need to be drafted. While this type of job isn’t flashy like a trial lawyer, tax lawyers still bring in a decent paycheck—the median pay is $99,000, while some make as much as $189,000 each year. Employment and labor attorneys work to ensure that the relationships between employers and employees stay balanced. Generally, they either represent the employers (management) or the employees, which are sometimes unions. They are compensated well for their work—the median pay for an employment lawyer is $81,000 with the high end reaching toward $100,000 per year. Judges are the lawyers who make decisions about cases in trial court. 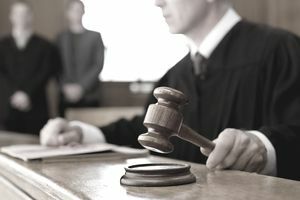 Usually, it takes many years of experience and potentially a nomination and election process to become a judge in the United States, but that varies by state. Judges are usually generously compensated for their work—the median salary is $130,000, with some making as much as $177,000 each year. Real estate attorneys review offers and contracts and make sure that buyers are getting fair deals on the properties they are purchasing. Real estate lawyers also work with sellers to make sure everything is fair on that end, as well. While real estate attorneys make decent salaries—the median is $80,000 and it can get as high as $147,000—it was reported that nearly one in four real estate attorneys are not awarded benefits. While you were in law school, did you discover that you liked the academics of law, the theory and the teaching of law? Maybe you’d rather be a law professor than practice law! Law professors work steadier hours than attorneys, in most cases, but the competition is fierce. They are handsomely rewarded for their hard work, too—the median salary for a law professor is $128,000 with the high end reaching $194,000. Do you have the lofty goal of becoming a managing partner in a law firm? Achieving this goal is not an easy one and will require long hours and a large amount of hard work. Managing partners are rewarded for all of their sleepless nights, though—the median salary for a managing partner in a law firm is $139,000, and that can go as high as nearly $400,000 in big cities and prestigious firms. Beware, though—these BigLaw, partner-track positions can cause burnout and other mental health issues. To all of you who are trying to decide what kind of law you’d like to practice—good luck, and choose wisely!